When a storm approaches cows will run away from the storm and a Buffalo will charge towards it. When we are faced with difficult challenges in life, sometimes it seems easier to ignore or run away from adversity. We encourage our players to face their challenges head on, one step at a time and to not to give up when things get tough. In the end, a buffalo gets through the storm quicker and in better shape than the cow. We teach players to play and celebrate successes as a team. All Buffalos Players are taught to help each other when someone is having difficulty learning a skill or technique. We Play as One - refers to One Team. In addition, we promote club pride and cross support all of our teams as one club. We consider our member as "family" and hold many social functions through out the season. Our goal is to create teams that play together for an extended amount of time beyond one season or year. A small club atmosphere; develop quality teams as well as quality players. Our Board works hard to keep cost down and be the best "value" in town. Minimum of 3 hours per week of training plus games and tournaments. Rules, Motivational / Mental Development, Etiquette, Tactical Strategies & more. We want our players to be successful on and off the field. Coaches review report cards and counsel kids if they are not doing well on time management. NCAA College recruitment plan and assistance The Sport Source, founded by Charlie Kadupski, former coach and mentor to Executive Director | DOC, Chris Sage). 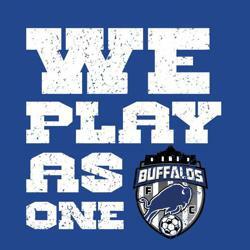 The Buffalos FC starts training kids competitively at the U10 / U11 age group and can have teams as old as the U19 level. We started out with two (2) small-sided teams at the U11, and U12 age groups so they can eventually merge into a full-sided team at the U13 level. Regardless of the make-up of the small-sided teams, the Club is adamant that the teams get the same experience in terms of training until they merge. This is a different model compared to the other clubs in San Antonio; most clubs in San Antonio, TX will accept all players interested in joining their program and then promote players based on their individual achievements to another team in a higher division, in some cases this creates an environment of "a team of individuals". BFC wants the team to earn their promotion to a higher division level, all BFC teams have a goal to play at the top level by the time they are U17 (sophomore in HS). The other reason for only carrying one team per age group is it creates a sense of club pride; because it means more than just paying club fees to be Buffalos FC Player - not every player can be a Buffalos FC player. All current BFC players are encouraged to keep up with the overall development of the team and improve their individual level of play during the year. If a player falls behind, the coaching staff will work with that player as much as possible to get them up to speed. However, it is understood if a player does not demonstrate the desire to improve by working extra hours on their own and/or coming to extra training sessions and after giving that player a proper chance to prove their value to the team; their spot with be given to a new player during the tryout window between May/June of a given year. No cuts are ever made between the Fall and Spring seasons of a given year unless there is an extraordinary circumstance. Recreational "Grassroots" Program: Currently, BFC registered its recreational teams with the MAYS YMCA. BFC coaching staff work with the kids at the U5-U10 to introduce basic soccer skills and team the players to have FUN, we want kids to fall in love with the game. A U10 player can start playing at the competitive level. Finally, playing through the YMCA is easier on our parent’s pocketbook.